We are very happy to announce a new discounted offer on frieze magazine exclusively for 1000 Words readers. Over the past last twenty years, frieze has firmly established itself as the leading print publication in the field of contemporary art and culture. 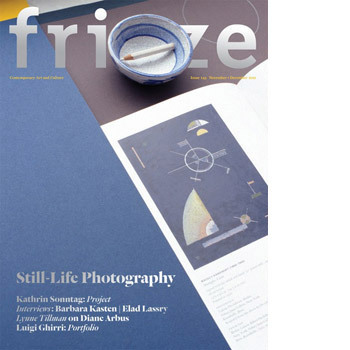 Astute critical analysis, exquisite design and through using informed and dedicated writers (guiding principles which are very close to our heart), frieze still continues to be the magazine of choice for today's brightest and most forward-thinking writers, artists, curators and collectors. 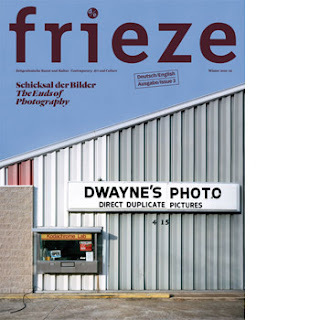 Here, we present a short preview of the current issue of frieze, and frieze d/e their new quarterly bilingual journal, both current issues of which are entirely dedicated to photography! In the new issue of frieze Elad Lassry discusses his sculptures that "happen to be photographs" with curator Mark Godfrey, articulating the relationship between objects, the importance of the frame and the potential of "nervous pictures." Plus, Chris Wiley looks at new approaches to photography in the work of a number of US-based artists and David Campany discusses the intertwining of art and commercial photography in the genre of still life. Also featuring: Gilles Deleuze, Luigi Ghirri, Barbara Kasten and Kathrin Sonntag, as well as Lynne Tillman on a new book on the writing of Diane Arbus that prompts a deeper understanding of her work. Alfredo Jaar answers the questionnaire: "I distrust images". With 40 reviews from 26 cities including: 'Untitled (12th Istanbul Biennial)'; 'September 11', MoMA PS1, New York; 2011 Folkestone Triennial; 11th Biennale de Lyon and Yokohama Triennale 2011. As well as exhibitions from: Athens, Beirut, Berlin, Brescia, Brussels, Cologne, Dublin, Dundee, London, Los Angeles, Mexico City, Munich, Moscow, North Adams, Osaka, Paris, Portland, Porto, Stockholm, Vienna and Zurich. Editor Jennifer Allen considers the status of photography after the end of film. Plus, Hans-Peter Feldmann contributes an exclusive artist project. Also featuring: Marieta Chirulescu, Haris Epaminonda, Holger Hiller, Dorothy Iannone, Albert Oehlen, Rudolf Schwarzkogler, Hito Steyerl and Christina Zück. With 20 reviews from 16 cities including: Aargau, Berlin, Cologne, Dusseldorf, Hamburg, Innsbruck, Kaufbeuren, Lausanne, Leipzig, New York, Stuttgart, Vienna and Zurich. Receive frieze and frieze d/e through your door and save 25% on newsstand prices.